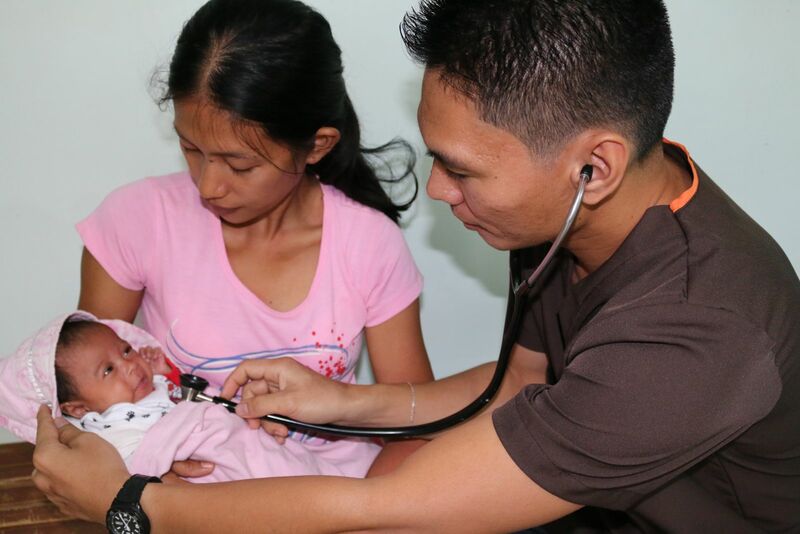 Nurse Reymund Lumantas helped save the life of this baby girl with newborn resuscitation skills he learned through the Jhpiego-supported MindanaoHealth Project. Nabunturan, Philippines—Jessa Mae wasn’t breathing. She was born prematurely one evening at the Nabunturan Rural Health Unit, and the local health officer advised her parents to prepare for the worst. Jessa Mae’s heart rate was low, and though the birth attendant had placed the baby against her mother’s chest for skin-to-skin contact—routine post-birth care to ensure a baby stays warm in the first hours of life—there was no response. Nurse Reymund Lumantas stepped in to help. He had recently participated in a training course in essential intrapartum and newborn care (EINC) organized by the U.S. Agency for International Development’s MindanaoHealth Project, which is implemented by Jhpiego, and the local non-profit organization Kalusugan ng Mag-ina, Inc. (translated as “Health of Mother and Child”) in partnership with the Department of Health’s regional offices. Lumantas quickly set to work, preparing a space and equipment to resuscitate the baby. He set her gently on her back on a flat surface, and began pumping air into her lungs with an Ambu bag—a common handheld device used to help patients breath. Her chest began to rise and fall. And then Jessa Mae cried. Lumantas is among more than 600 health care providers who have improved their newborn care skills through the MindanaoHealth Project. As the International Council of Nurses meets in Seoul, Korea, June 19-23 for their 2015 conference, the new skills gained by Lumantas underscore the importance of strengthening the capacity of nurses worldwide and increasing their numbers to meet the health needs of women and families. “Because I underwent the EINC training, I am confident that I am doing the right thing, and I am going to save the lives of more babies,” Lumantas says. Before the training, “blue babies” like Jessa Mae had little chance to survive. Lumantas and fellow health workers lacked the confidence and knowledge to perform newborn resuscitation. They didn’t understand the importance of the “Golden Minute” —a window of time in which health workers must act to save a newborn’s life. Lumantas himself was apprehensive going into the EINC training. He was participating with a wide range of health care providers, many of whom had more experience than he did. But he knew that the skills he would learn there would complement and refresh his previous training in basic emergency obstetric and newborn care (BEmONC), so he persisted, listening and learning, and gaining valuable hands-on experience in practice sessions and simulations. Lumantas has benefited personally and professionally. “I wanted to be confident when I went back to the facility, so I would know how to deal with emergency cases,” he said. “Now, I am confident that I can handle emergency cases during delivery. I was trained on BEmONC, and refreshed through EINC, plus I was able to successfully handle real cases and revive two sick babies. “Now, I see Jessa Mae and although she was delivered prematurely, she is healthy. We were not expecting she would live. It is very fulfilling,” he said.